What is EDGAR and how can fraudulent information be posted to it so quickly? How easy is it to post documents to EDGAR? How could the SEC have known this filing was possibly a fraud? The SEC could have cross checked some of the “facts” from the filing before allowing it to be posted to their EDGAR system. If they had done this, they would have found that many of the facts were false. Maybe the SEC should install a speed bump and put in place a verification system so filings like this can be screened out before they do significant damage to the market. Has a fake filing on EDGAR ever happened before? Is anybody at the SEC doing anything about this? Unfortunately, we think Commissioner Stein’s concerns will be overlooked and this EDGAR problem will continue to occur until a more high profile situation occurs. This case demonstrates how quickly markets react to news. Market makers and specialists who normally would have acted as a sanity check are no longer there to help screen for this type of fraudulent news. The case also highlights the fact that there is very little real liquidity in the market. 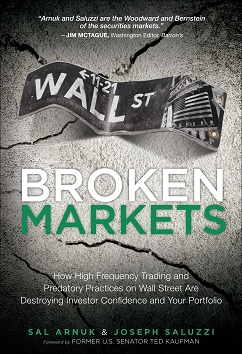 Instead, many stocks (especially in the middle of the day) are simply being arbitraged by high frequency trading firms who are inserting themselves as artificial intermediaries looking to scalp a few pennies from less sophisticated algorithms that are leaving predictive patterns. While the SEC sits backs and ponders whether a 350 microsecond speed bump from IEX is fair, they continue to allow their own antiquated EDGAR system to be used a tool by manipulators to cause substantial damage to the market. We think they need to get their act together and start focusing on one of their main goals – protecting long term investors.